The World Cup has finally come to a close with the German Machine ending Messi’s dream run, and now it’s time to turn our attention to domestic soccer, but the big news in MLS has not been about the Americans but the international footballers the league is attracting. In the 2015 season, two fading superstars, Spanish striker, David Villa and Brazilian international, Kaka, will join the MLS. 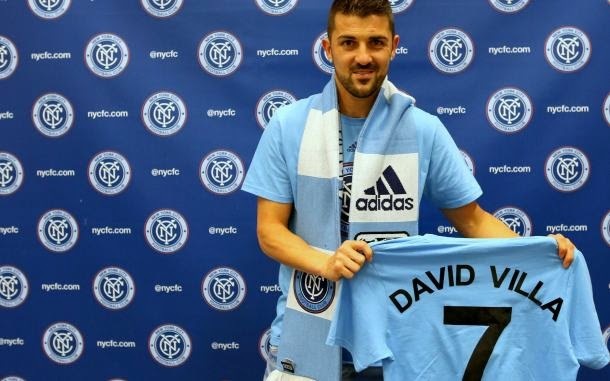 David Villa will be the centerpiece for New York FC, the new MLS squad that is jointly owned by the New York Yankees and Manchester City, while Kaka will lead squad based out of Orlando, FL, Orlando City SC. Kaka and Villa join other soccer stars who played many years at top clubs in Europe but opted to spend their final years playing in the MLS. Any athlete knows that to be the best you’ve got to play with the best, and you’ve got to be the little fish in the big pond before you can be the big fish in the big pond. But eventually, after you pay your dues, sit on the bench for a bit, train with the best, learn from the veterans and climb the ranks… if you put in the work… you become the shark in the ocean. You’re no longer the little fish in the big pond, your’re the BIG FISH in the BIG POND, and that is exactly what these players did. David Villa trained 7 seasons playing with other clubs in La Liga until he won the Euro Cup and World Cup with Spain in 2008 and 2010, and the Champions league with Barcelona in 2011. He put in the work so that he could be the all-time leading goal scorer for Spain. In realm of world football, Villa was among the best of the best. Kaka’s hard work has also been realized in his career. Since signing with Sao Paolo FC as a 15-year old, he has received over 100 caps with Brazil, been apart of a World Cup winning team with Brazil, won the Ballon d’Or and helped AC Milan win the Champions League. Kaka was a common name on the tongues of young footballers in the early 2000s- he was THE big fish in the big pond. Villa and Kaka were without a doubt, among the best of the best. The other option is to say goodbye to the glory days in the top flights and make a change to another league. Play in a league where they can continue playing the game they love, but the level of play is such that they can continue being the best until the end of their days. Now don’t confuse this for something that it’s not. I’m not bashing the MLS, and I’m not unhappy that these players are joining the MLS. I’m planning on going to the first NYFC and Orlando City game I can. Are you kidding? Villa and Kaka! That’s amazing. But let’s not convince ourselves that Villa and Kaka coming to play in the MLS is something that it’s not. They are not coming to the MLS because they want to “win championships on other continents” or because they truly want to grow the league. Sure, maybe those are added benefits, but the primary reasons Villa, Kaka and potentially Xavia (just in) are coming to play professional soccer in the US is because they’ve accomplished everything they want to and now they want to end their careers having fun playing in… well, a rec league. Because to them that’s what the MLS is. I’m not saying the MLS is a rec league, and I am a strong believer that one day the MLS will be among the best leagues in the world, but to the Villa and Kaka, even at their age, the quality in the MLS is barely a challenge for them. Yet, it’s a step forward for the MLS, ten years ago top players in the world wouldn’t even consider the MLS as a place to finish their careers, but now Americans care about the game just enough and the quality has improved just enough to attract some of the games best. The next step is to not just attract the best player in the world who are on their way out… but who are on their way up.